Manufacturers of commercial and domestic window roller shutters, roller grilles and trellis doors. Servicing Melbourne, Australia. Our range of plantation shutters and roller shutters for commercial and residential use. 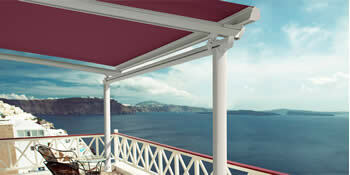 Our range of retractable veranda and patio roofs systems, folding arm awnings, and roller screens. Technologically advanced, affordable commercial roller grilles for protecting high visibility display areas. Keep your business safe with our range of strong, functional steel trellis security doors. Our security shutters, grilles and security steel trellis doors are suitable for securing homes, retailers on street fronts and shopping centres, commercial tenants, kiosks, clubs, serveries and bar tops, entrances, doorways and alcoves, cigarette counters, vans and trucks, loading docks, offices and many more. Eurotec Window Shutters commenced operation in 1986. It has become Australia's largest and Victoria's only modern security window roller shutters manufacturer. Our manufacturing facility in Pascoe Vale is one of the largest manufacturing plants of its kind in the southern hemisphere. As we value and appreciate your business, we are relentless in our efforts to provide uncompromising service, affordable security solutions for your home and or business whilst maintaining our focus on searching for innovative ideas and solutions. We have national representation and our qualified team of staff provide a complete service, from a free measure and quote through to design, consultancy, installation and maintenance.